Last week the Foundation children spent some time with their new teachers in their Year 1 classes. They were a little bit nervous but handled the changes to routine brilliantly, showing their new teachers how amazing they all are! Foundation had a fantastic day at Rookery Farm! We spent some time in the outside farm area, discussing the different animals we could see, what they eat and where they live. The children also had a chance to get up close to some of the animals in the Pets Corner - spending time stroking and petting goats and rabbits. The children were very careful to make sure they treated the animals kindly. All the grown ups in Foundation were really impressed with the children's behaviour on the visit; they represented Middleton brilliantly! 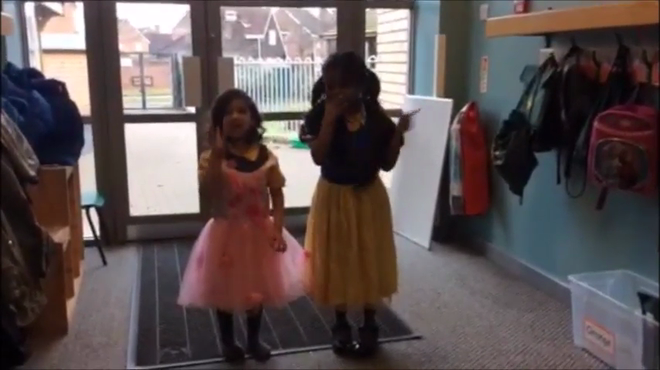 Strictly Come Dancing - Foundation Style! Our very own actress Miss Belam (who starred in Aladdin in Milton Keynes) choreographed us a Life Cycles dance. The children were very enthused by the Hungry Caterpillar story and used their knowledge of it to move through the stages of the life cycle. We have already had lots of fun this term. To celebrate St. George's day we learnt about all the different ways that people in England celebrate it. We made and ate scrumptious biscuits with the English flag on to celebrate at Middleton. On Monday 13th March the whole school took part in a Science Day. We did lots of exciting experiments and investigations including making boats out of different materials and seeing if they would float, exploring magnetic objects and looking at the vibrations that musical instruments create when we play them. We had so much fun being scientists and demonstrated some wonderful learning. Today we all had the chance to hold or stroke the chicks! We had to be very careful and make sure we didn't scare them. We used great descriptive language to talk about what it felt like to hold them and talked about how to keep healthy by making sure we washed our hands afterwards. 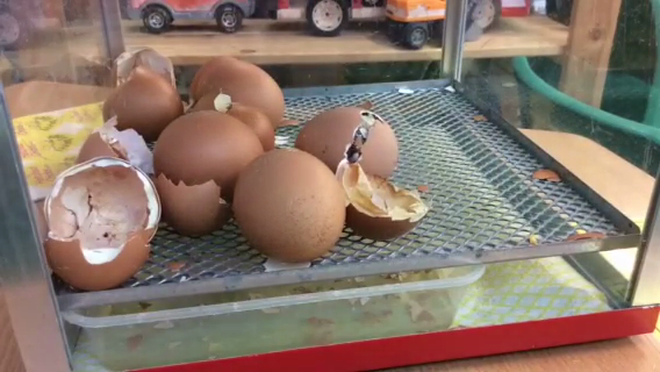 On Wednesday, during lunch, 2 more chicks hatched. Luckily we set up a camera to record the moment just in case we missed it! On Wednesday morning 6 chicks hatched! They are very cute and fluffy. They have been moved to the brooder box to give them some more room, while we wait for the other eggs to crack. The Living Eggs have arrived in Foundation and we are very excited! 10 eggs are in the incubator and are being kept warm. Talk for Writing - In Action! We loved dressing up as our favourite book characters for World Book Day. We showed off our costumes to our friends and then took part in lots of book related and reading activities throughout the day, including: practising our author autographs, drawing a book character selfie and making our own books! We had a special visitor as part of our People Who Help Us topic - Office Angus, a policeman! We celebrated Chinese New Year and found out it was the year of the Rooster! We loved finding out which animal represents our year of birth and enjoyed learning about the Chinese New Year story. We really enjoyed visiting the woods to find the Gruffalo! We loved finding each character and re-telling the story as we explored. We have come back from the Christmas Holidays feeling refreshed and ready to learn! We loved sharing with our friends about what we got up to over the break, using fantastic re-telling skills to do so! We have really impressed all the teachers in Foundation with how well we are doing with our independent reading and writing skills since we have come back! Foundation had a brilliant time celebrating Diwali. We dressed up in the traditional clothing, made lanterns and cooked Diwali sweets. Below are pictures of how we have been independently exploring these areas through choosing our learning. We have settled in brilliantly in the first three weeks and have already mastered assemblies, PE and the 'big' playground! We have been learning our classroom rules and can now 'stop and listen,' tidy up independently and get ourselves ready at the start and end of the day. We have improved our fine motor skills through painting, chalking, finger writing and pencil control.